Hives are caused by an allergic reaction within the body. Histamine is released under the skin and causes areas of swelling. They appear as red or white, raised welts on the skin. They can appear suddenly out of nowhere, and can spread rapidly. They are most common on the chest, tummy, and back, but can also be on the extremities, and rarely on the face. A very distinct characteristic of hives is that each welt will often come and go over a period of 10 to 15 minutes or as long as a few hours. You will see some welts on the tummy, and then look again an hour later and find them gone, only to see new ones on the back. The welts can be small or very large, round or irregularly shaped, single or clustered together and over-lapping. They usually itch, but not always. 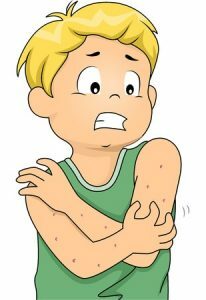 Illness – illnesses are the most common cause of hives in children. The body can have an allergic reaction to the illness. Foods – foods that most commonly cause hives include shellfish, nuts, berries, and fish. Medications – any medicine can potentially cause hives. Benadryl (diphenhydramine) is an antihistamine, available over-the- counter, and is the standard treatment for hives. At the first sign of hives, give your child a dose. Click on Benadryl for a dosing chart. It is best not to wait to give Benadryl to see if the hives go away on their own because some allergic reactions can proceed rapidly. The sooner the Benadryl is given, the less severe the reaction will be. You can continue giving Benadryl every 6 hours as needed.